When I retire I’m going to settle in a place where the sun is always shining and the drinks are cheap; so watching Judy Dench browsing colourful markets in the movie, ‘Best Exotic Marigold Hotel’, made me wonder whether India might be the retirement utopia I’m dreaming of. As it turns out I’m not the only one thinking this, because just last year the BBC filmed a documentary featuring six British celebrities discovering if retirement in India could really be like the movie. Just like Judy Dench and co, the celebs stayed for a month in Rajasthan’s royal city of Jaipur to navigate the complex web of Indian culture and customs, whilst still finding time to practise yoga and embark on a journey of self-discovery. Little did we know when we booked our stay in Jaipur, we had unknowingly checked into the BBC’s ‘Real Marigold Hotel’. I hadn’t seen the documentary, so I was surprised to hear about the BBC’s visit as we checked in. The owners said that their bookings had massively increased since the show aired, with many soon-to-be-retired Brits wanting to stay for extended periods of a month or more. 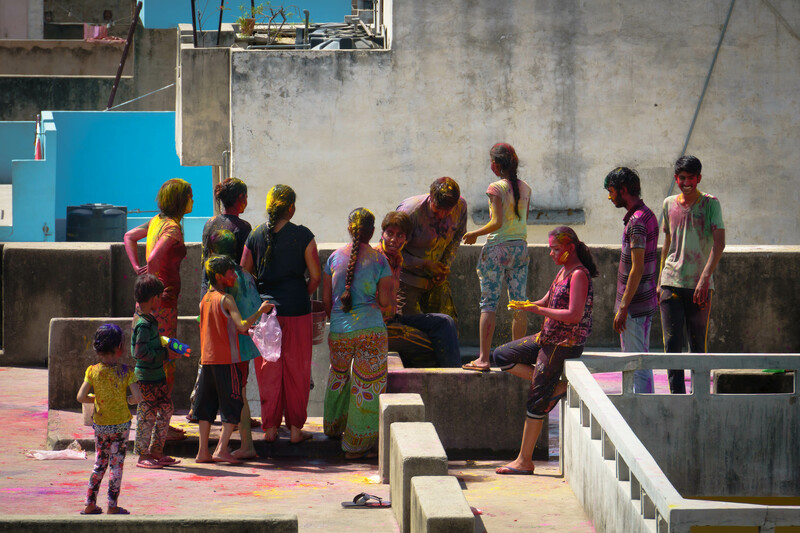 We didn’t have a month at our disposal, but we did have 4 days – one of which was Holi. We initially went outside to enjoy the colourful festival, but once the party started to get too rowdy on the streets we retreated inside to watch from the rooftop. One of my favourite memories from India is watching various games of Holi playing out on the terraces all around Khatu Haveli. I absolutely adored Khatu Haveli. It is centrally located in Jaipur’s old town, and the hotel will arrange transport if you want to go to the Amber Fort or further afield. In the evenings, we ate dinner under the stars on the rooftop. 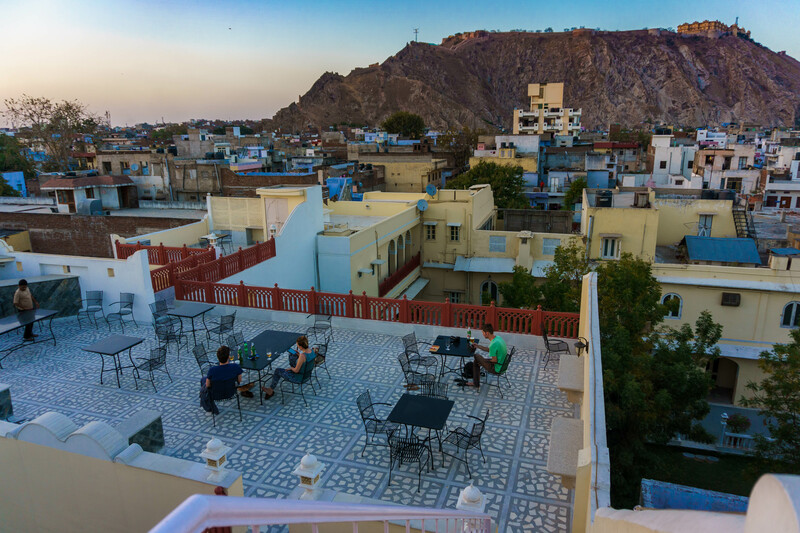 Far from being a hotel, Khatu Haveli retains an intimate guesthouse atmosphere where the owners join their guests around the table for dinner and conversation. 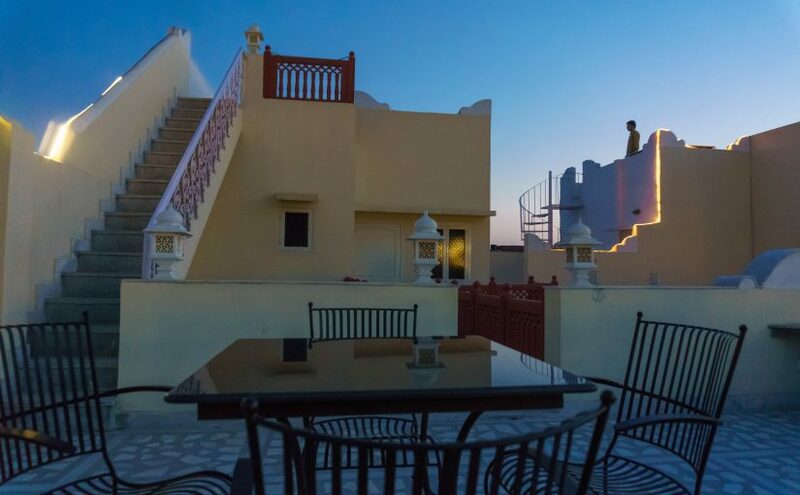 The owners of the Haveli offer a wonderful example of Rajasthan’s famously warm hospitality. After two years of living in Mumbai, I know that I’m no longer planning to retire in India – there is no visa that would currently allow it anyway – but it was a relaxing few days in a gorgeous setting, and it’s a great base for a visit to Jaipur. 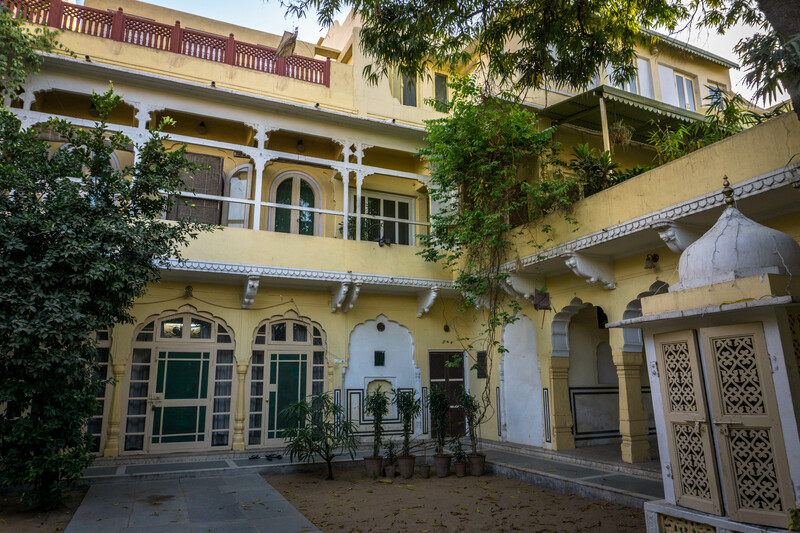 If you would like to know more about Khatu Haveli, you can visit the website here, and if you enjoyed this post please share on your social media channels. That’s so cool that they did a documentary on this hotel and you had no idea about it. I love surprises like that 🙂 That happened when I went to an Island and Greece and didn’t realize I was at the same location where they filmed Mamma Mia! Oooh! I would LOVE to go to the Mamma Mia! location – it’s so pretty in that movie. Oooh, let me know if you get to India next year! Holi is a lot of fun, but watch out for the guys – there is a tendency for their hands to wander where they shouldn’t. Hi Elaine! Great post! Is this the hotel that they actually filmed the movie “The Best Exotic Marigold Hotel” at or just the documentary? It seems very familiar from the film, especially the terrace… Would love to go there one day. My dad is from India, so I’ve been a few times, but never to Jaipur and it’s also been a long time since my last trip. It was only used for the documentary, as far as I know. It really was very lovely. Where is your dad from? Living in India was certainly quite the experience! How was the experience of Jaipur city? Did you like the food? I loved the food in Jaipur! There was always so much of it and it was REALLY good 🙂 We were in Jaipur for Holi, so we didn’t get around as much as we would have liked to, but we did get to the Amber Fort, which was incredible! We had a great auto-rickshaw driver show us around. I was surprised by just how dirty Jaipur is, that was quite unexpected. I was living in Mumbai; so not exactly unused to India, but still parts of Jaipur really shocked me. It looks amazing! Was 4 days really enough? I’m not sure India would be on my retirement bucket list but I can relate to somewhere where the sun is always aging and the drinks are cheap! 4 days is never enough in India, but it was a nice taster. I was living in Mumbai, so we had just gone up to Rajasthan for a couple of days away. Oh wow, I really enjoyed watching the documentary on TV and you actually stayed there! I have seen the documentary since and it was amazing! I stayed in the room that the darts player was in. You should send her there, she would love it! Looks like utopia indeed! The building and views looks so beautiful! Thank you! The view from the terrace was wonderful. After reading this delightful post, I’m probably going to watch the BBC documentary tonight 🙂 Thanks for sharing! Oh my gosh! How fun! I’m hoping to finally make it to India on my next trip to Europe starting in 2017. It’s pretty cool that you made it to the ‘Real Marigold’ purely by chance! What a great surprise! Where will you be travelling to in Europe and where will you visit in India? Sounds like a busy trip, but it will be amazing!